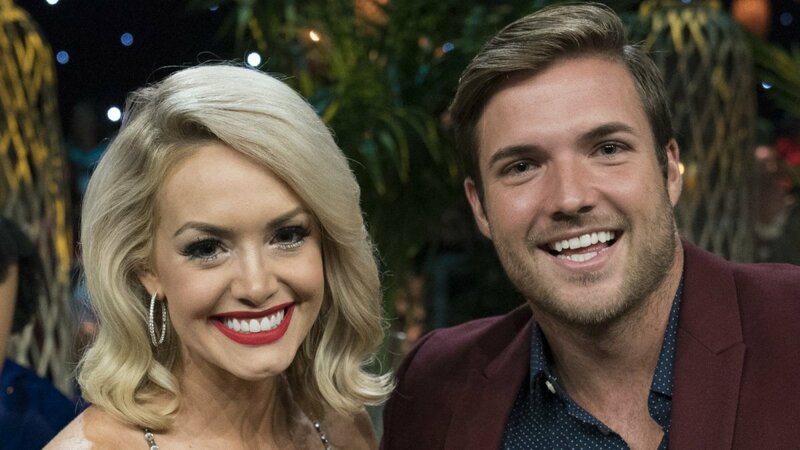 Jenna Cooper and Jordan Kimball's alleged cheating scandal has taken yet another nasty turn, with Cooper accusing her now-former fiance of belittling her during their relationship and treating her poorly. Cooper's publicist, Steve Honig, issued an unflattering statement about Kimball to Reality TV World on Monday morning claiming Kimball's behavior toward Cooper changed drastically after they got engaged during the filming of Bachelor in Paradise's fifth-season finale this summer. "After the cameras stopped rolling, Jordan's demeanor toward Jenna changed dramatically. He let it be known there was only room for one celebrity in the relationship, he was more successful and famous than her, she would never make as much money as him or amount to anything in life," Honig said in the statement. "She was belittled and made to feel insignificant and worthless. He continues to disparage her to this day. As painful as this has been for Jenna, she is glad he showed his true colors before they were married and began building a life together." Kimball, however, refuted such claims in a statement to People. "Anyone who knows me... knows that I say all the time that I'm not a celebrity. I'm not going around belittling anybody. I cried when she departed just hours before me from Mexico," he said. Over the weekend, Kimball had opened up to Us Weekly about how he thought the drama was finally over. "I've heard nothing back [from Jenna] and her family stopped -- I guess you could say bashing me online. They have said nothing. She has said nothing. It's behind us," said the male model. Cooper's publicist also reiterated her prior claims that she is innocent and forensic testing of her iPhone, iPad and iCloud backup has proven she never sent an alleged set of leaked text messages which appeared to show she was cheating on Kimball with another man after they returned home from filming Bachelor in Paradise. Screenshots of the alleged texts were released by Reality Steve spoiler blogger Steve Carbone just before Bachelor in Paradise's finale aired on September 10, resulting in Kimball breaking up with Cooper the next day. "A comprehensive forensic examination of Jenna's devices by an independent third-party expert has definitively confirmed none of the text messages in question came from Jenna's phone," Honig said in his statement to Reality TV World. "Given the conclusive findings of the forensic report, Jenna's team is considering all options available to Jenna relating to the fraudulent texts." Honig provided Reality TV World with a copy of the forensic analysis report which was prepared by Protus3, a North Carolina-based security firm. The report states the alleged texts were not found on Cooper's devices or backups when they were collected for forensic analysis by Protus3 on September 18, a week after screenshots of alleged texts were released. Over 6,500 text messages, including "269 recovered deleted text messages," were collected, according to the report, and text messages dated between June 11, 2017 and September 18, 2018 were analyzed. However, the report does not definitively state whether any additional non-recoverable texts could have sent and deleted from Cooper's devices before the data was collected on September 18, and only focuses on the alleged texts not being among the texts that were collected and analyzed. When asked to clarify the apparent discrepancy between his "definitively confirmed" statement and the report's contents, Honig told Reality TV World "we are standing by the results of the report as stated." "The report shows deleted texts were recovered during the relevant timeframe," the publicist wrote. "You'd have to talk with the experts to get more detailed information on deleted texts. Right now we are standing by the results of the report as stated." Last week, Kimball posted screenshots on Instagram of an alleged threatening email he had received from an attorney representing Cooper. The alleged email accused Kimball of fabricating the text messages between Cooper and an unidentified man -- who told Carbone he was Cooper's real boyfriend at the time -- to paint Cooper as a liar and a cheater. The alleged email demanded Kimball release a public apology for hurting Cooper or else face legal action. The attorney further claimed Kimball was ignoring their attempts at communication and avoiding the situation because he was guilty. Kimball has insisted on multiple occasions he did not fabricate any text messages and is the victim in the situation. In fact, he said he would swear on a Bible that he's falsely being accused of wrongdoing. Not only did Cooper allegedly bash Kimball in the messages by saying she's better than him and doesn't even like him -- never mind love him -- but she also wrote some graphic sexual things to the man who appeared to be her boyfriend. "I know you're upset about this week's episodes but... this is all for my business. You know how much I need the money. Me and Jordan aren't together for real. I don't even like him let alone love him," Cooper allegedly wrote in a text. "I'm better than him and once I'm able to," the texts continued, "I'll break it off for good and make up some story to make him look bad if it'll make you feel better. He means nothing to me and never has... All for work and networking. You're the only one I need in my life. The only guy who interests me." But Kimball previously admitted to People that he got to know Cooper very well, and after reading the text messages, "in my heart, I know it's her."